The most common calendar type for colleges is the semester system. The school year is divided into a Fall and Spring term of approximately 15 weeks each. Students usually take four or five classes each semester. The summer session may be split into shorter terms with longer hours. The vast majority of colleges and universities use the semester calendar system. A quarter system divides the calendar into four equal terms with the traditional school year consisting of a Fall, Winter, and Spring term of 10 to 12 weeks. The Summer term is the same length as the other quarters but not part of the standard school year. Students usually take three classes each quarter. Over two hundred colleges and university use the quarter calendar system. The 4-1-4 calendar is a variation of the semester system with a January term between the Fall and Spring terms. The January term consists of only one class for the entire period. This allows classes to meet at outside the regular time schedules or even travel off campus as part of the studies. 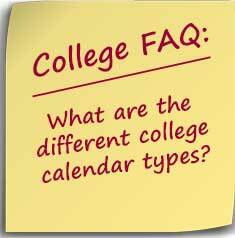 Over 100 colleges have a 4-1-4 calendar system and many participate in an January exchange program. The block system consists of eight 3 1/2 week sessions where students take only one class at a time. Generally, students complete an entire semester class in one block although some classes may require two consecutive blocks. The block system allows intensive study of one subject with freedom to schedule classes as necessary. Some students find taking math and science classes on a block system more difficult than a semester system. Colorado College and Cornell College use the block system. Trimester may refer to the traditional academic year divided into three terms similar to a quarter system or to three semesters of equal length throughout the entire year. The more common situation is three equal terms, Fall, Winter, and Spring, for the academic year with a possible separate summer term. The other form of the trimester system is a variation of the semester system. In a trimester system, the summer session is the same length as the Fall and Spring terms. The goal of the trimester system is to allow students to select any two semesters to complete their academic year.